The residential heart of industrial South Wilmington is the black, working-class neighborhood of Southbridge. Southbridge has long been identified by WILMAPCO as one of our region’s Environmental Justice (EJ) neighborhoods. Like other EJ areas, Southbridge warrants special attention to support equity in the transportation planning process. Our involvement in Southbridge began in 2005 with the development of its community-driven Neighborhood Plan. We were approached to help craft the Plan’s transportation section. Following its adoption, WILMAPCO conducted a Walkable Community Workshop to identify specific pedestrian needs. A list of projects (such as new crosswalks and fresh sidewalks) was created. A Traffic Circulation Study, funded by DNREC and WILMAPCO, was completed in 2008. This study made several key recommendations to improve the transportation network in Southbridge. Staff are today working through the South Wilmington Planning Network (SWPN) to implement these improvements. The Network is a partnership of dozens of agencies, residents, and businesspeople who work collaboratively to improve quality of life. The South Wilmington Special Area Management Plan (SAMP) is a cooperative effort to create a vision for the revitalization of South Wilmington. This SAMP is a “master” plan that coordinates the efforts of government entities and stakeholders in addressing social, economic, and environmental issues in a way consistent with the long-term vision for South Wilmington. In 2014, the SWPN completed a Progress Report of the objectives within the Neighborhood Plan: PDF. 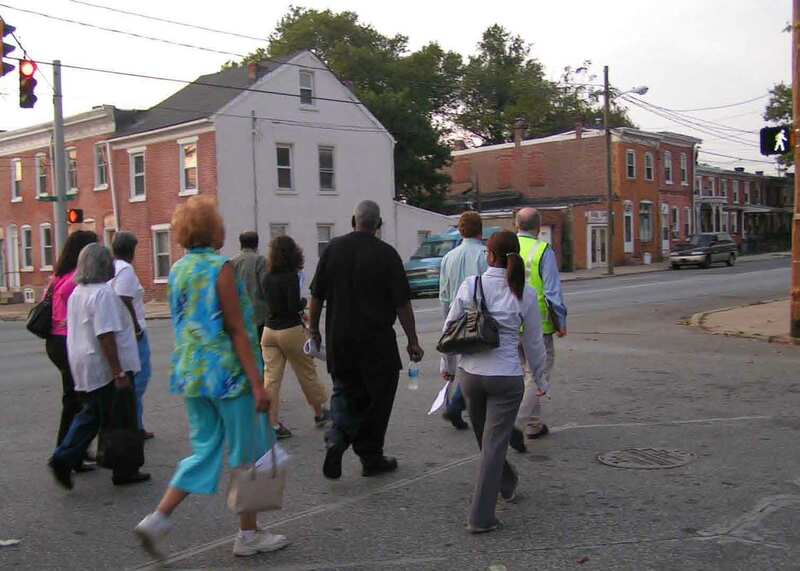 On a warm evening in September of 2006, WILMAPCO planners visited Southbridge to conduct a Walkable Community Workshop. Community residents joined the planners and, working together, dozens of pedestrian problems were identified. Broken stretches of sidewalk were discovered, along with unsafe intersection crossings and pockets of poor lighting. A report was published outlining these trouble spots and, at the request of the community, WILMAPCO developed a neighborhood-level prioritization process to rank the proposed projects found in the report. Along with working towards improving pedestrian conditions, WILMAPCO conducted a Traffic Circulation Study in Southbridge. The study fully evaluates the future transportation needs of the community and makes recommendations. Community involvement was a high priority throughout the development of the Southbridge Circulation Study. Three public meetings were held in coordination with the neighborhood’s civic association. At the June 17, 2008, civic association meeting, Southbridge residents voted unanimously to approve the recommendations listed above. Released in May 2009, the South Wilmington Signage Study aims to lighten the burden of truck traffic in Southbridge. It is an implementation piece of the Southbridge Circulation Study. Trucks create noise, safety and health concerns amongst residents. They have pointed to the area’s route signage network as lacking, leading to lost trucks in Southbridge. The South Wilmington Signage Study seeks to improve route signage while not compromising the area’s economic development. Some of the signs have been erected, reducing truck complaints. In another effort, WILMAPCO has formed a partnership with the Elbert-Palmer Elementary School, the Southbridge Civic Association, Nemours Health and Prevention Services, the City of Wilmington and DelDOT to develop a Safe Routes to School (SRTS) Program in Southbridge. Several pedestrian improvement projects (click here for a map) were funded with this grant, the first phase of which was completed in 2010. Most of these immediate-term projects are in close vicinity to the school and include: sidewalk replacements, curb ramps, striping of crosswalks, and numerous signage enhancements. A second phase was constructed in 2015. The Safe Routes to School National Partnership has recognized this work in Southbridge as a top practice nationally. See more. So has the National Center for SRTS: webinar presentation. We also have been working closely with the Southbridge Civic Association, DelDOT, the City of Wilmington and other agencies on a major streetscape project. This project involves traffic-calming and streetscape improvements along Heald Street, New Castle Avenue and A Street in Southbridge. The concept plan for the project includes elements of the Southbridge Environmental Enhancements Project in the Wilmington Urban Corridors Plan (click here to download), projects ineligible for SRTS funding, as well as other streetscape recommendations found in the Circulation Study. Local match funding for the project is being provided by local elected officials, the City of Wilmington and WILMAPCO. Full construction is expected in 2016, and a concept plan for a second phase of streetscape enhancements was completed in 2016. Members of the SWPN meet in November 2011. 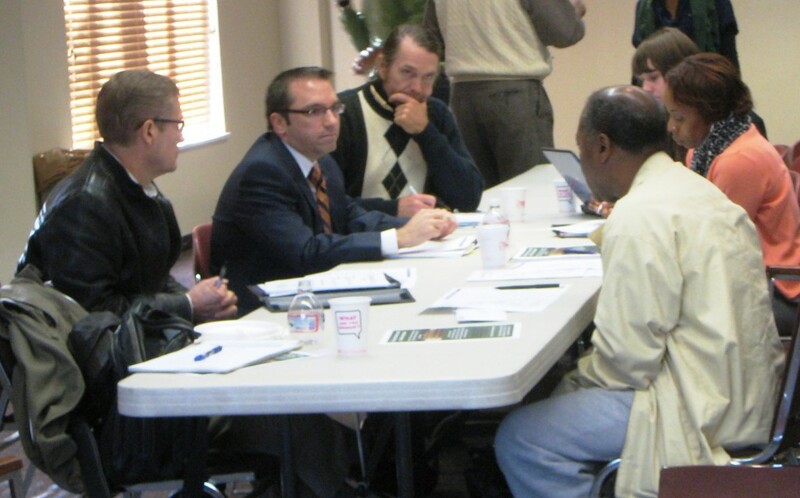 If you have any questions about WILMAPCO’s involvement in Southbridge, or would like to join the South Wilmington Planning Network, please contact Bill Swiatek at 302-737-6205 or bswiatek@wilmapco.org.